From the Marlow Explorer 78 series, PATAGON has twin CAT power and shallow draft allowing a wide cruising range. A comfortable interior includes 4 Owner/Guest staterooms, VIP forward, full beam Master, a spacious Salon and Dining area, and enclosed Pilothouse. Equally comfortable deck areas - Flybridge, cockpit and swim platform - all make "Patagon" an ideal yacht for cruising adventures with family and friends. Continually maintained and enjoyed by her owner of 8 years, last refit in 2017 has made PATAGON better than new. Owner prepared her to go to Europe for 2 years and had a change of plans due to family reasons. Versatile with her shallow draft, efficient and economical passage making @ 9/10 knots, while planing @ 20 knots and with max speed 24 knots, PATAGON is ideal for Atlantic and Caribbean cruising and is completely ready to go on her next adventure. 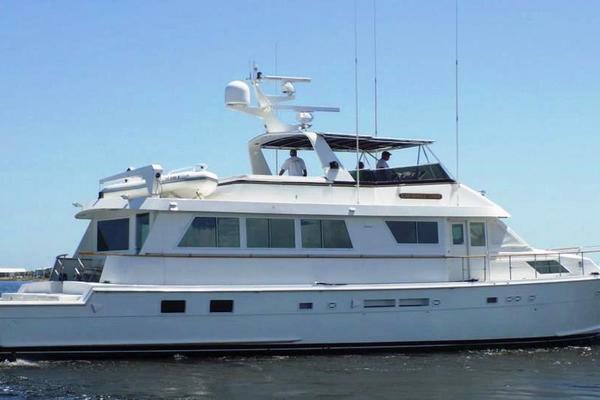 United Yacht Sales New Jersey would love to guide you through a personal showing of this 78' Marlow 78e 2004. 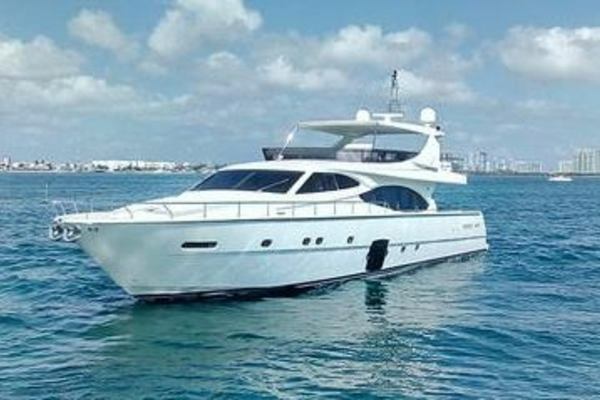 This yacht for sale is located in Miami, Florida and priced at $1,950,000. For a showing please contact us by filling out the form on this page and we will get back to you shortly! "Patagon" featuresa 4 stateroom layout pluscrew accommodations,with teak and holly soles throughout.Starting all the way forward is a chain locker in the forepeak followed by a VIP Stateroomwith head to starboard. Following to port is another Guest Stateroom with ensuite head, and opposite to starboardanother Guest Stateroom with laundry center. Next aft down steps is the full width Master Stateroom withtwo ensuite heads and shared shower. Up steps center is the Pilothouse with helm to starboard, a dinette to port and two weather deck doors. Next to starboard is the Galley with a large Saloon and Dining Area down steps aft. The Saloon is fitted with a Wet Bar, Entertainment center with new 50" TV, settee and dining table. Exiting aft is the cockpit with dinette and settee. Decks port and starboard lead to the bow with Portuguese bridge. The Flybridge and boat deck are atop the Saloon and Galley, with the CrewCabin aft beneath the cockpit deck. Only the finest components like Dupont Kevlar, CoreCell and enginering construction fabrics are specified for the hull, deck and superstructure of the Marlow Explorer. Vinylester and Epoxy resins and glues are used throughout. Only top quality mechanical components like Aquadrive constant velocity joints, Tides seals, Trace inverters are used. On the lovely hand finished interior quality brands like Sub Zero, Dacor, Asko, Bosch, Franke, Grohe and similar are found. Fine fabrics of Ultraleather and other top brands grace the interior. The result is reminiscent of an era when quality, not quantity was the hallmark of a fine yacht. From the Marlow Explorer 78 series, PATAGON has twin CAT power and shallow draft allowing a wide cruising range. A comfortable interior includes 4 Owner/Guest staterooms, VIP forward, full beam Master, a spacious Salon and Dining area, and enclosed Pilothouse. Equally comfortable are her deck areas - Flybridge, cockpit and swim platform. Continually maintained and enjoyed by her owner of 8 years, last refit in 2017 has made PATAGON better than new. Owner prepared her to go to Europe for 2 years and had a change of plans due to family reasons. Versatile with her shallow draft, efficient and economical passage making @ 9/10 knots, while planing @ 20 knots and with max speed 24 knots, PATAGON is ideal for Atlantic and Caribbean cruising and is completely ready to go on her next adventure.